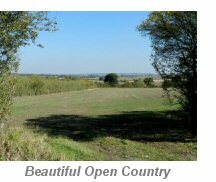 This 7½ mile circular walk starts in Hawbridge, just south of Stoulton and includes delightful woodland and quiet open countryside. 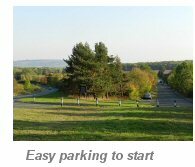 Park in the slip road at or near to Feli's Bar & Restaurant (previously known as The Fusion Brasserie) just south of Stoulton off the B4084. 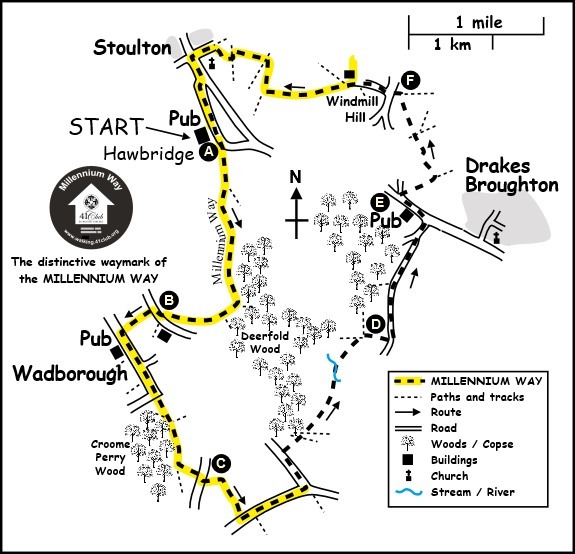 Refreshment can also be taken at the Plough & Harrow, Drakes Broughton, and Mason's Arms, Wadborough.For part of the walk, you will enjoy the delights of The Millennium Way where you will be guided by the distinctive green Millennium Way waymarkers. Find out more about the walk by clicking on the information icon. We begin our walk from Feli's Bar (previously known as The Fusion Brasserie). 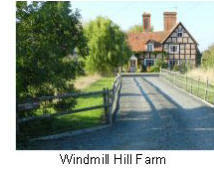 Go along road keeping Feli's Bar on your right and after approx 100yds take the public bridleway right. Here you are on The Millennium Way and will see the distinctive green waymarker. Go over stream and take rough track left to field. Go ahead over field to lone tree. (Sometimes the farmer fails to reinstate the footpath across this field - we are trying to rectify this situation, but in the meantime you have to do the best you can, taking care).vAt lone tree go 1/4 right to find footbridge over ditch just to the right of a large oak tree at corner. Go over bridge and fence stile bearing left through undergrowth to go with hedge left passing by several cross country horse jumps.vOn reaching corner of wood continue with wood left for 100 yds to exit field by stile (or gate if open ) then ahead to exit next field by stile. Continue ahead in large field with woods left to field corner, (do not exit field by corner stile) instead continue around field edge with hedge left to pass to rear of houses, to exit via large gated gap to road. Go right on road for some 200yds then take stile left into field. Go with hedge left through field then over stile and through what is marked as private garden, but is more like a small orchard, to take stile to road. Go left on road into Wadborough, passing The Mason's Arms on right. Continue straight ahead past the road junction left (Mill Lane). Where the road makes a sharp right turn, leave the road and continue straight ahead down bridleway. Cross small wooden bridge, and follow the bridleway through the wood ignoring crossing path. At the sharp left turn (by the single way post) do not cross plank bridge but swing left and continue on woodland track, passing farm buildings right to reach road. Cross road and go 20 yds right to take footpath left. Ignore entrance to wood and go ahead into field. Go with wood left and after some 200 paces find hidden waymark left in the hedge ( sometimes difficult to find in undergrowth.) At the waymark go right directly across field (You may need to look carefully to see where the farmer has defined the footpath) to find footbridge and stile. Cross stile then continue ahead across field passing close to lone tree aiming for hedge gap to find road. Go left on road for approx 1/3 mile until you reach Crabbe Lane on left. (Here we leave the Millennium Way). Turn left along Crabbe Lane and opposite the entrance to Crabbe Farm take stile to waymarked path right and go diagonally ½ right across field to find and take metal gate in hedge. Follow angle of yellow waymarker of left hand path to cross next field keeping wood on far left. Exit field just to right of oak tree via hedge gap and follow waymarker into next field to walk along field edge with trees and scrub right. Cross wooden footbridge over stream and continue directly ahead over next field keeping to left of lone tree. On reaching the wide hedge gap, do not go forward through gap but turn right along edge of field keeping hedge left. At the field corner take metal gate to road. Turn left on road which is Chevington Lane. Walk to the junction with Mill Lane and go right to the main road ( marked left to Worcester and right to Evesham and Pershore.) Cross road and go left towards Worcester. Go past the Plough & Harrow pub and carry on towards Worcester to a minor road junction on your right marked " No Entry " for vehicles. Turn right up this road to find footpath sign on right. Turn right and follow ahead with hedge right to reach the edge of woodland. Turn left here for approx 100 yards until you reach the corner of tall hedge. Take wide gap right to enter next field, then turn immediately left down edge of field with trees and then hedge left and caravan site left. At field corner go over stile following the wooden fencing left to reach metal fencing by field corner and track into caravan park. Go right on the track along field edge keeping hedge and metal fence left. On reaching field corner go through gap then continue ahead across field heading towards hedge corner in distance just to right of small white topped wooden post. Continue in same direction with hedge left to reach field corner. Go through gap and turn immediately left through wooden kissing gate into large grassy area at rear of houses then proceed diagonally 1/2 right to take a further wooden kissing gate in far corner. (This small paddock may be a collection of enclosed fences so no access, but easy to walk around the right edge and pick up the walk). Go left after gate for a few yards to find corner stile to road. Turn right for 30 paces down road then go left down Windmill Lane. Ignore footpath left and continue ahead along rough track on bridleway passing entrance to both Windmill Hill House and Windmill Hill Farm on right. Veer slightly right to keep low brick wall to your right and then go forward to pass between metal barns / stables and go through gap ahead into field. Stay forward keeping hedge right and ignoring gap. Pass small pond on right and continue ahead with hedge right. Go through corner metal gate and follow yellow waymarker keeping ahead for a while with hedge right. After entering then emerging from short area of woodland, cross brick footbridge and continue through metal kissing gate to take right hand footpath and go with trees right. Keep ahead eventually to pass under power lines to find narrow gap and metal kissing gate in far hedge. Take kissing gate and go left to continue up field with hedge left. At field corner go left to walk between hedges and after about 130 paces look out for metal gate right. Go through gate to proceed through walkway between fences. At end of walkway take metal gate to churchyard then ahead to exit via far ornamental metal gate to road. Here go left to pass in front of St. Edmund Church and continue along lane to reach the main road. Turn left at main road, cross over and after 200 yards continue down slip road to arrive back at your starting point. 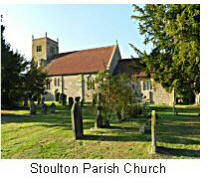 Stoulton parish church dedicated to St Edmund King and Martyr is Norman and dates from 1120. The windows date from the 13thC and the tower was rebuilt in 1936. It has a peel of 6 recast bells. H B Kingford donated much to this church in memory of his father who was onetime vicar here. The carved panelling and stained glass came here from St Helen’s Worcester. The woman spinning in one window is a portrait of Rev Kingsford's daughter, Madelaine Chaytor. In the churchyard are the memorials of two local families the Blizards and Hemus’. These generous benefactors left a charitable fund to supply bread to villagers, a practice that continued up to the time of rationing in wartime. The old vicarage dates from the 17thC and was rebuilt in 1820. 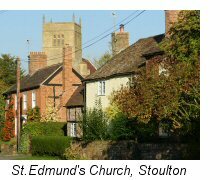 The village formed part of the Eastnor Estate until 1917. The old school house was once lived in by Gustav Holst's half-brother, who played the cello, and taught music in local schools. The village school was opened in 1877 and closed in 1933. 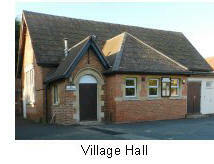 Today it is used as a village hall. The Mount was a staging posting house on the London Road. Is now Grade II listed Several windows were bricked up in the days of window tax but are now reopened. A yearly Wake was held outside the inn, with stalls, backsword play and shin kicking. The landlord presented copper kettles as prizes. Wadborough is a small old farming community, with its nearest church a mile away in Pirton. Wadberge is first mentioned by King Edgar in 10thC when the village belonged to Pershore Abbey. 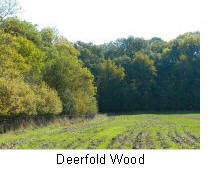 Wad is derived from old English woad and berge being a hill. Woad dyes were produced out of main towns (Pershore is 4 miles away) due to the dreadful smell. Wadborough railway station was to the west but shut down in 1965. Pevsner describes Wadborough Park Farm as a medieval moated site now a dramatic ruin. Deerfold Wood was a refuge for nightingales and a census of 1934 showed 40 birds singing over a range of 12000 acres in this area.